And you want more jobs here. then stop voting the way you do and vote for a change in our policies! In the alternative energy debate, itâ€™s important to question if ethanol is a good idea at all. It lowers fuel efficiency in cars by 30% over the same amount of gasoline. If you are using 10% ethanol gasoline…, it shaves 3% off your mileage even if it doesnâ€™t negatively impact performance. If you switch to E85 fuel, your car will require about 1.5 times as much fuel per mile, and your fuel pump and injectors will have to be larger to allow an adequate amount of energy to reach the engine. Senator Thune of South Dakota, a major ethanol producing state, claims that ethanol saves the consumer 50 cents per gallon. However, the lower fuel economy overrides that benefit. Ethanol can corrode steel and polymer engine parts that were designed for gasoline, so your repair costs may climb as well. U.S. taxpayers also have to shoulder the cost of ethanol subsidies, so government intervention is hardly free. If the subsidies disappear while mandates remain, the direct cost will jump substantially as well. Ethanol creates new transportation and safety hassles as well. It canâ€™t be moved via pipeline, so it has to be shipped via ship, truck, or railcar. Transportation opens up opportunities for accidents and fires. Unfortunately, most fire departments lack the training and specialized supplies necessary to meet the unique challenges of ethanol blazes. Ethanol vapor is more flammable than gasoline, and its nearly invisible flame canâ€™t be extinguished with water. Corn made record highs yesterday, trading at $6.74, (See Chart) “as cold, wet weather delayed planting and flooded fields.” We wouldn’t have this problem with the cold if we had some of that (gasp!) global warming! Corn’s yield potential falls unless plants have emerged from the ground before the end of May in most of the Midwest. Corn planted in wet, cool soils develops shallow roots, increasing the threat of damage from hot, dry weather in July and August. Soybeans have broken out of consolidation and appear ready to challenge the record high of $15.70 (See Chart). Wheat’s slide may be over (See Chart). One could look at the chart of Rice and conclude its fall is about over (See Chart). Pretty soon we will have to turn all that ethanol back into corn! And Oregon’s Gov. Kulongowski stealing a page from Marie Antoinette, may tell us, “Let them eat ethanol!” Get those guillotines sharpened! This was just announced in October, 2007. You’re darn right it deserves a second look. Bill Gates’s investment arm sold 1.1 million shares of Pacific Ethanol Inc.’s stock from April 21 to May 2, according to a document filed with the Securities and Exchange Commission Wednesday. At a Brazilian ethanol conference June 4-5, Brazilian government-funded researchers said they have perfected a method of producing cellulosic ethanol that drastically reduces the cost of processing. Cellulosic ethanol production has to first break up the cellulose. (Cellulose is polymerized sugar.) Though the price of doing that has dropped by a factor of 10 in the past decade, it is still around $2.25 a gallon. Now the Brazilian process brings the price down to $.35 to $.50 a gallon. That could have a big impact on agrarian countries and could lessen the overall demand for oil for gasoline. What’s the Cost of Biofuels? More than you think. I received an email from Ronald Steenblik, Director of Research at Global Subsidies Initiative (GSI) about the costs of alternative energy subsidies in relation to President Bush’s SOTU speech and his recommendations to reduce gasoline consumption by 20% over the next decade. The Administrationâ€™s proposals for the new Farm Bill include $210 million to support an estimated $2.1 billion in loan guarantees for cellulosic ethanol projects in rural areas, and another $500 million to fund a “Bioenergy and Biobased Product Research Initiative”. The total ethanol consumed over the next 11 years, GSI estimates, could be 231 billion gallons. Multiplying this by the $0.51 per gallon tax credit (the lower of the ethanol and biodiesel tax credits) yields roughly $118 billion. Also not counted in our $118 billion figure are state-level incentives, many of which are in the neighborhood of $0.20 per gallon, and some of which range as high as $0.50 per gallon. House Bill 2210 is big and complex, delving into state land-use laws, petroleum markets, tax law and agriculture policy. The end result, however, could be a shift away from food production at some farms to take advantage of growing government and consumer interest in alternative fuels. A new tax credit for farmers who grow crops for biofuel and for those who refine the raw product into fuel. The amount of credit is yet to be determined and will be discussed when the bill goes before the House Revenue Committee. Our tax dollars both locally and nationally are going for an enormous boondoggle and our politicians are lying to us or being deliberately vague about the costs. Today’s Business Section in The Oregonian has an article by Harry Esteve titled Legislators are getting on biofuel wagon. Oregon would join the national fervor over biofuels under a bill that appears to be on a fast track for passage in the Legislature. The package of tax breaks and gas-blending requirements is meant to add horsepower to the state’s fledgling industry of turning products such as corn and canola seed into fuel for cars. The bill is “good” for farmers and allegedly lowers pollution, something the big city voters want. Ethanol is good is it not? Well, not so fast kemo sabe! Ronald R. Cooke recently wrote WHAT IS THE REAL COST OF CORN ETHANOL? for Financial Sense. 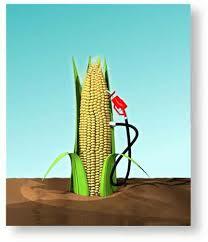 Thanks to Federal mandates and subsidies, corn used for the production of corn ethanol is expected to increase from ~ 700 M(illion)Bushels in 2000/2001, to 3.2 B(illion) bushels in 2007/2008 â€“ an increase of 357 percent. On December 11, 2006, the USDA estimated 2006-2007 U.S. ending stocks would be 935 million bushels, down from 1.97 billion bushels in 2005-2006. That decreases the ending stocks by more than 50 percent and puts the ending stocks to use ratio at 8%, – the lowest in 11 years. It should be obvious to all, we are going to need a lot more acreage and big yield improvements if corn production is going to keep up to demand. Prices could exceed $4.50 per Bu by the end of 2008. Since 2000, the price of beef is up 31%, eggs up 50%, corn sweeteners up 33%, wet corn milling up 39%, and corn flakes are up 10%. Chicken prices havenâ€™t changed very much. Yet. Anxious to make sure its corn ethanol mandate gets done, Congress has also decided to take our tax money and use it to subsidize the production of ethanol. The current ethanol subsidy is a flat 51 cents per gallon of ethanol paid to the agent (usually an oil company) that blends ethanol with gasoline. But there is more. It costs money to store, transport and blend ethanol with gasoline. Since ethanol absorbs water, and water is corrosive to pipeline components, it must be transported by tanker to the distribution point where it is blended with gasoline for delivery to your gas station. Thatâ€™s expensive transportation. It costs more to make a gasoline that can be blended with ethanol. Ethanol is lost through vaporization and contamination during this process. Gasoline/ethanol fuel blends that have been contaminated with water degrade the efficiency of combustion. E-85 ethanol is corrosive to the seals and fuel systems of most of our existing engines (including boats, generators, lawn mowers, hand power tools, etc. ), and can not be dispensed through existing gas station pumps. And finally, ethanol has about 30 percent less energy per gallon than gasoline. That means the fuel economy of a vehicle running on E-85 will be about 25% less than a comparable vehicle running on gasoline. Cooke analysis suggests the total cost of Corn Ethanol @ 85% Blend is $6.89! Corn ethanol does little, if anything, to reduce the tailpipe emissions of late model cars. It is likely E85, when compared with standard gasoline, will reduce tailpipe emissions from oxides of nitrogen, 1,3-butadiene, and benzene. Methane and total organic gas emissions are greater. Carbon monoxide ad CO2 results vary from reasonably good to really terrible. The real eye opener is a large increase in formaldehyde (isnâ€™t that the stuff they use to embalm dead people? ), and a huge increase in acetaldehyde emissions. A suspected neurotoxin, exposure to acetaldehyde vapor will irritate the victims eyes, skin and respiratory tract. The State of California has determined that acetaldehyde is a carcinogen. 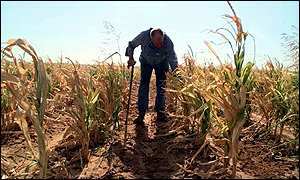 Cooke says we may release more pollution into the atmosphere producing more corn. Corn requires copious quantities of oil and natural gas for herbicides, pesticides, and fertilizers. These â€“ along with tons of eroded soils â€“ are deposited as a polluted waste in our rivers and oceans. I have only scratched the surface of the long article, but it is clear that there are many unintended consequences and costs that haven’t been talked about leading me to believe that Ethanol is another government boondgggle. I shake my head when Sen Hillary R. Clinton wants to grab all the “obscene” profits of the oil companies and invest that money strategically in alternative fuels. I shake my head that the Democrats in Oregon would fall for this and require that I buy something that could hurt my car.